This is an excerpt from an essay that Kalpana Karunakaran wrote on her mother, Mythily Sivaraman. The essay was written for a book of recollections by several people who knew Mythily. Growing up as Mythily's daughter meant discovering, early on, that my mother was different from anyone else I knew; it meant being part of a household that was different from most other households. For me, it was as natural to see my mother speak at a public meeting as it was to watch her type, write, argue, and have night-long discussions with the many friends and comrades who frequented our home. I grew up with the sense of an open home. In the mottai maadi, the top floor balcony of our old house, Amma's comrades would sit in a circle and rehearse Madhar Sangam songs as I pedalled around them on my blue tricycle. How I saw my mother also came to be shaped by how others saw her. When I was a very young child, I remember a TV interview in which she explained how important pengal sangam, women’s organisations are and how they could help women. I was playing in a friend’s house once, when, on hearing my talk about AIDWA’s agitation for women’s toilets in public places, so that working class women may relieve themselves in safety and dignity, my friend’s grandmother commented, “I hadn’t stopped to think, before now, of what women working on the streets do to answer the call of nature. Our keeraikaramma, vegetable seller, is always on the move — where does she go?” My mother’s political world did not endat the doorstep of our house. I was about two or three when I heard the story of the polladha pannaiyaru, the evil landlord from my mother, along with the stories from Ramayanam that my grandmother told me. When I was asked to narrate the Ramayanam by my extended family, who regarded me as a story-telling wonder-child, my mother would immediately order me, “Now tell us the story of the polladha pannaiyaaru”. She made her point well. After all, many stories of bloodshed, war, martyrdom, injustice can move us and make up our memories. Why is the story of a prince who was denied his throne more worthy of committing to memory than that of 44 landless poor who were burnt alive inside a hut in Keezhvenmani? Having a young child to look after could not have been easy for my mother in the 1970s and the 1980s – the most intensely packed years of her political activism. While my grandmother’s constant presence in my life and care-giving allowed my mother to travel frequently, it came at a price. When I was 10 months old, she returned from a visit to find me happily playing in my grandmother’s lap. Apparently, I took one look at her and burst into tears, which made my grandmother rebuke my mother sharply, informing her about how wrenching her absence had been for me. I was told that, when I was about two years old, I would sit on my mother’s lap, surrounded by her friends and comrades, and close her mouth with my hand, saying, “Pesakkoodathu, don’t speak.” Sometimes, I would follow it up by throwing anything I could find at them — pens, books, coffee tumblers, dabaras — hoping to chase them away. During the Emergency period, when I was two and a half years old, she went underground. She spent two months in South Africa in her brother’s house. During this period, she called home once and said to me, “Naan amma pesaren da, this is amma speaking.” I believe I said, “Yentha amma? Which amma?” leaving her guilty and more than a little sad. 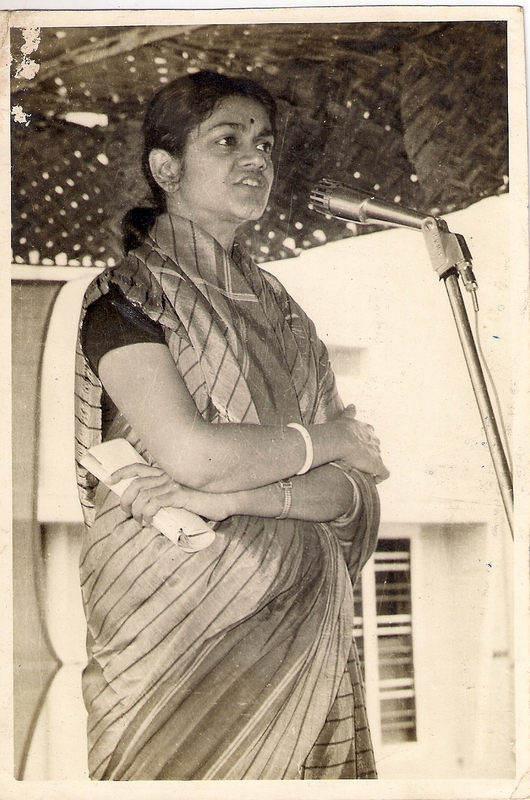 In 1987, her mentor, V P Chinthan, suddenly died. His demise left a void in her life. The Soviet Union had also started to disintegrate, and my mother’s moods would often darken at the slightest provocation. Unhappily enough, I was on the threshold of my teens at the same time. During this period, we would have many fights. Sometimes, she would sit at my bedside in the evenings, arguing with me, and weep in a manner that I had no way of responding to. I did sense that this was not really about me, although I also felt aggrieved that I was being targeted. Looking back on this period, I feel that she was, perhaps, lonely, grieving for V P C, and, maybe, even seeking my companionship. But I was too young and too self-absorbed to give it to her. In the last few years, I have come to realise, and be grateful for it, that I have discovered my mother in some new ways even as I lost her in other ways. Shortly after my mother was diagnosed with Alzheimer’s in 2007, I began rehearsing for a Tamil play, Kalakkanavu, staged by the feminist theatre collective Marappachi. The play traced the multiple political moments in history that enabled women’s emergence in the public sphere in the early part of the 20th century. My great-grandmother, Subbalakshmi, was also a character in the play; I played her role. Reading my mother’s book on Subbalakshmi for the first time, I was moved by the book, and ashamed to be reading it so late. 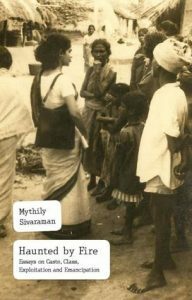 In early 2011, urged by V Geetha, we started to put together a collection of the essays that my mother wrote in the Radical Review, and other journals, from the late 1960s to the early 1980s. This book was called Haunted by Fire, and was published by LeftWord Books in 2013. To initiate work on this project, Geetha gave me a deadline to locate and gather all the pieces of writing in English that my mother had done throughout her life; she’d spent four decades of her life writing. The deadline was useful. I scrambled to make sure that I left nothing out. This process was an eye-opener for me. While I, of course, knew that she had edited and written for the Radical Review, I was not prepared for the depth and the erudition of her writing, or her painstaking research. I would often stop and start reading particular pieces even before the work of putting them together was done. I was haunted by the visual image of a wispy young woman visiting village after village, all wracked by class-struggle, in Thanjavur and Nagapattinam, documenting whether the red flag flew there, and if not, asking when it would fly again. My mother was not a typical Indian mother by anyone’s standard. But there is nothing to regret here. In fact, there is much to celebrate. She has given me a rich legacy of memories that I am still struggling to make sense of. Her life-choices, personal and political journeys, constantly force me to ask myself if I am living a life that is worthy of her. Who could ask for more? Kalpana Karunakaran is Assistant Professor at the Humanities and Social Sciences Department, IIT Madras. She researches and writes on gender, poverty, women’s labour and microcredit. As an activist-organiser with the Tamil Nadu Science Forum (TNSF), she has worked as coordinator of women's Self Help Groups and organized 'Right to Health' campaigns. Kalpana was a National Executive Committee (EC) member of the Indian Association for Women’s Studies (IAWS) for the period 2014 to 2017. She participates actively in workshops, conferences and campaigns initiated by NGOs and women’s rights organizations.